This Shotgun Shell Bag has two large pockets for room enough to hold two boxes of shells, plus spent hulls. 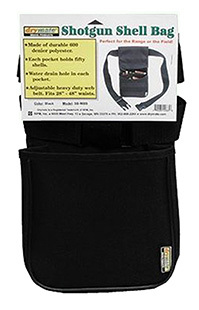 The heavy duty 2" wide web belt adjusts to fit 30"-48" waists. Constructed of rugged 600 denier polyester, each pocket has water drain holes and is perfect for the range or field.